A graphic recorder’s work can aid in helping people understand a concept, show a group’s perspective on a topic or help focus a group during a meeting. I am usually hired by a meeting facilitator or a project manager. My role is one of silent partner and my focus is on what is transpiring at the meeting I’m recording. I don’t do any talking except for a “hello” here and there....I'm too busy listening. RECORDING SURFACE: We will discuss the documenting surface before your event and figure out what would work best for the goal of your meeting and any space constraints. WHAT YOU ARE LEFT WITH: As a person or a group of people are talking, I am drawing and writing what I hear. Afterwards, you are left with big posters or boards that serve as a visual documentation of the meeting. I will also take pictures of the final product and send those digital images to you in the days following the event. You can send the image out to your meeting attendees, use it on your website or in social media. NOT LIMITED TO A WALL: My skills can also be used to help create timelines, templates or other visual support aids for your next meeting, event or even for the employee lunch room. BRAINSTORMING SESSIONS. You've got your people in a room trying to come up with some new ideas and you need them to be focused and engaged. When people see what they have said being drawn by me, they know that they have been heard and that feels good. Audience participation tends to increase when there is a graphic recorder in the room. The graphic recording also serves as a reminder of what transpired and can help propel the group to take the actions they discussed. Employees that couldn't make your meeting can be brought up to speed about what they missed using the graphic recording like a map. TIMELINES. A timeline of what your business has done up to this point and then drawing in the hopes and dreams for the future is a catalyst for action. That timeline can be placed in a common area for employees to see or the image can be uploaded to your internal website. This can help remind people of future goals and how they fit into making that picture become a reality. KEYNOTES. A graphic recording is a great way to give longer legs to a keynote speaker’s talk. Your attendees can take a picture of the finished recording to help them remember what they learned and to share it with others. The image of the work can be used in your social media feeds to share with your followers. WORLD CAFES. A World Cafe is a methodology for running a large group meeting and engaging everyone in a dialogue. Graphic recording is a big part of a World Cafe where everyone is encouraged to draw. Financial number dumps or for a reiteration of your PowerPoint slides. and this one in Inside Business Magazine. 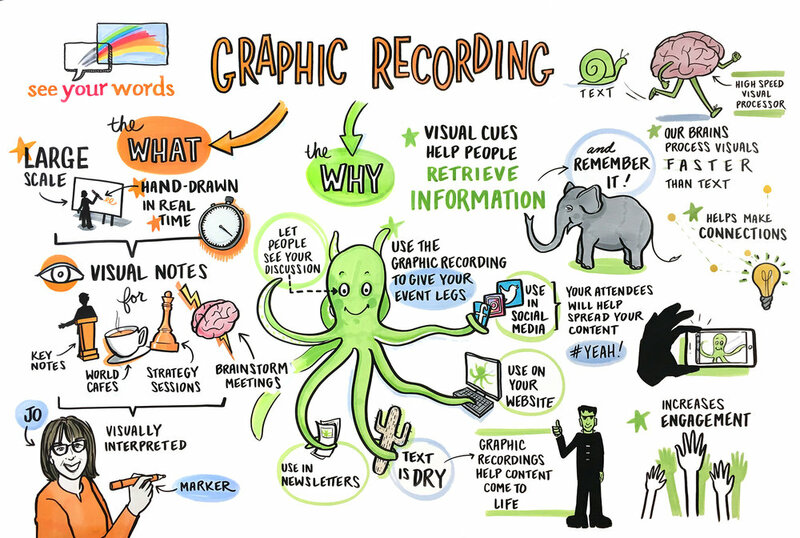 See what the Harvard Business Review had to say about graphic recording.